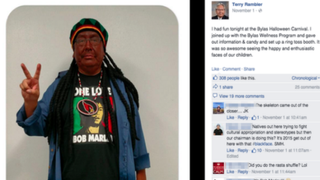 An Arizona Native American leader who has been adamant about his efforts to have the Washington Redskins' name changed because it's offensive to American Indians posted a photo of himself in blackface dressed as Bob Marley. According to the New York Post, Terry Rambler, chairman of the San Carlos Apache Tribe in Arizona, posted the photo wearing a dreadlock wig and dark face paint along with the caption, "I had fun tonight at the Bylas Halloween Carnival." "I joined up with the Bylas Wellness Program and gave out information & candy and set up a ring toss booth," he continued. "It was so awesome seeing the happy and enthusiastic faces of our children." Several of Rambler's friends pointed out the irony of his outfit on his Facebook wall. The photo has since been deleted from his Facebook page. Rambler declined the Post's request for comment.